After the deafening glory that fell on the artist with the painting “Bathing a red horse”, Petrov-Vodkin is looking for new themes for creativity. He was always known as an excellent portrait painter, but the theme of the child portrait became new for the artist. He will return to it repeatedly, depicting children of different nationalities and ages. The painting “Portrait of a Boy” in 1913 depicts a young man of thirteen. He is not quite a child, but he will have to go a long way to full maturity. This contrast of the ages and tried to display the author. Strict facial features indicate that the boy has already left the tender childhood age. He stands on the threshold of youth, where he will have to bear responsibility for his actions. The simplicity and severity of the face speak of the boy’s awareness of his transition. But childhood has not receded forever. The soft and penetrating look of brown eyes attracts the viewer’s attention to them. The shade of melted chocolate gives silkiness and transparency, from which the eyes seem deep. Depth of sight symbolizes the future of the boy: it will come, but it is not known what will be. Separately, you should speak about the background. 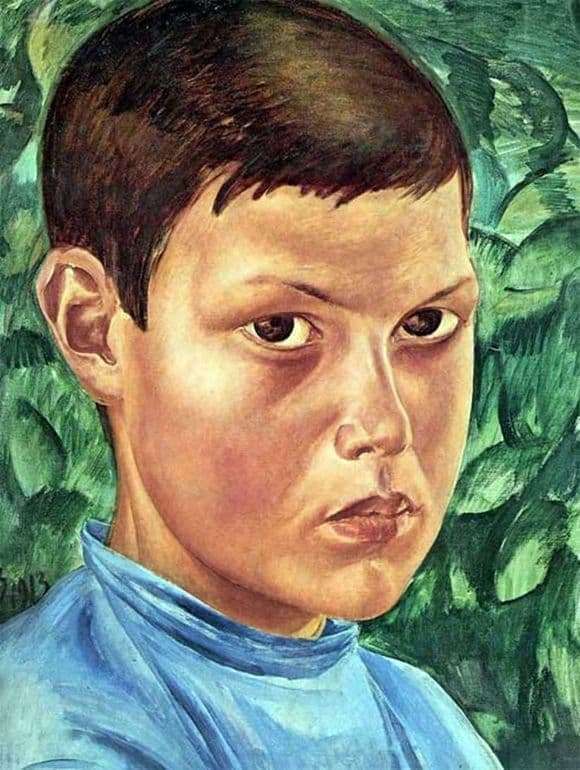 In order not to distract the viewer’s attention from the face of the boy, Petrov-Vodkin used soft and muted tones of green. This color is known for its ability to pacify. And the association with spring and green herbs emphasizes the idea that the boy is just beginning to grow up, and life for him is still full of beauty. This child is as fresh and clean as the first spring green and full of energy and feelings. This is easy to judge by the saturation of hues. Different background strokes can be taken as an interpretation of the boy’s thoughts. They are like waves that are constantly in motion, absorbing each other. The whole canvas is full of faith in humanity and love for the smallest members of society, which will make up its future.